If you’re an upperclassman, you know what Fall Fest is. 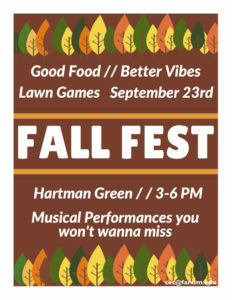 If you’re an underclassman, you… also know what Fall Fest is. It’s hard to miss the plethora of advertisements on campus and questions shouted across Hartman about going to the event. Since it’s just a few days away, I met with Elena Robustelli to discuss how she lead the curation of this year’s artists as the head of CEC’s Fall Fest music committee. The process started in late June and tends to be a “job of prediction;” the artists need to be more popular the day of the event than the day they were booked. Within the guidelines of a budget and the preferences of F&M students, the process for selecting artists becomes the brainchild of creative and logistical processes. Sifting through Spotify for new releases and rising artists to fit the guidelines mentioned above is the number one goal. The CEC music committee “wants really awesome talent; [they] also want diverse talent. So many festival lineups can be whitewashed… A lot of people really liked the EDM sound and having top 40 songs remixed, but then it’s a balancing act because… EDM is such a genre that’s dominated by white men. We have to make sure our other acts are super diverse.” The committee wanted to make Fall Fest and Spring Arts more diverse and more accessible to holistically represent the student body. The Choomies, F&M’s Kpop dance group, is going to open for The Lost Kings and Prinze George on Saturday. This is a huge part of F&M’s culture, and seeing them perform on Saturday will definitely bring diversity to the event. Also surf The Choomies’ entire youtube channel; their videos are so well-made and showcase the diverse talent that Elena and the entire music subcommittee wanted to emphasize this year. Their high energy is evident especially in their rendition of HANN. Want to get a taste of the artists gracing Hartman this weekend? I recommend starting with The Lost King’s “First Love,” “Stuck,” and “When We Were Young.” “First Love” has an ethereal quality around the chorus but definitely also sticks to the EDM vibe that was such a hit for Spring Arts. Prinze George’s “Victor,” and “Wait Up” take the flowy background of The Lost King’s work and emphasize it. Prinze George has what Elena describes as an “indie dream pop” vibe: think Tegan and Sara meets Florence and the Machine. There’s an addictively soft, wispy quality to the vocals. They don’t necessitate moshing, so just grab a snack from one of the food vendors and chill on Hartman while they’re playing. Once Fall Fest is over, you can jam in Shad to their chill vibe while studying. If you’re interested in helping with the music subcommittee for Spring Arts, shoot Elena an email at erobuste@fandm.edu. Sophomore Maya Workowski is a Contributing Writer. Her email is mworkows@fandm.edu.